The recent internet surveillance law, Investigatory Powers Act 2016 in United Kingdom (UK) ignited intense discussion. The new bill was called ‘Snoopers’ charter’ and ‘The most extreme surveillance law ever passed in a democracy’. It requires the internet and communications companies to keep customers’ browser history for up to a year. Petitions, organisations and demonstrations are held in order to overturn the bill. As United Kingdom is still one of the members of European Union (EU), the laws protecting privacy such as the Data Protection Directive is applicable in the UK as well. Besides the privacy-protecting law in EU, UK has its own law to ensure citizens enjoy the rights to privacy. The Protection of Freedoms Act 2012 introduced in February 2011 restricting and controlling collection, storage, retention, and use of information in government databases. It also guarantees citizens in the UK to enjoy greater security of their privacy. For example, judicial approval is needed for certain surveillance activities by local authorities under the Act. Also, it extends Freedom of Information rights by requiring datasets to be available in a re-usable format. According to the Home Office of the UK, the main function of the Investigatory Powers Act 2016 is to maintain intelligence agencies’ current capabilities and keep the British public safe. Under digital age, the new bill will restore capabilities that have been lost as a result of changes in the way people communicate. Therefore, the government can have a more comprehensive monitor of people under the new bill. In the Investigatory Powers Act 2016, the internet and communications companies are required to retain customers’ browser history and even the usage of apps for up to a year and government can access to these data. Also, the law reaffirms the ability of intelligence agencies such as MI5 to collect communications data from the public and to hack into a suspect’s electronic devices. The new bill allows a judge r to sign off warrants for intrusive surveillance as well. The U.K. has been pioneering government-imposed data retention. 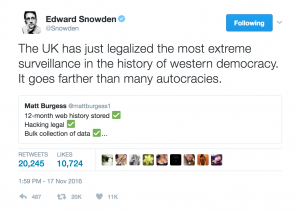 The Investigatory Powers Act 2016 may also set a model for other democratic countries to follow. For example, Brazil and Australia are now discussing on the data retention laws. Critics worried that the new US president, Donald Trump will use the new bill as a reference to launch surveillance law as well. Says Camilla Graham Wood, Privacy International’s legal officer. The Investigatory Powers Act dramatically increases transparency around the use of investigatory powers. It protects both privacy and security and underwent unprecedented scrutiny before becoming law. Besides petition, many organisation opposing the new bill was formed such as ‘Don’t Spy On Us’. It is an organisation formed by varies of human right groups in the UK and Europe like Article 19 and Big Brother Watch. The organisation held different campaigns to express their opinion. For example, the organisation sent a briefing to all members of parliament after the parliamentary committees that scrutinised the Bill made 127 recommendations. 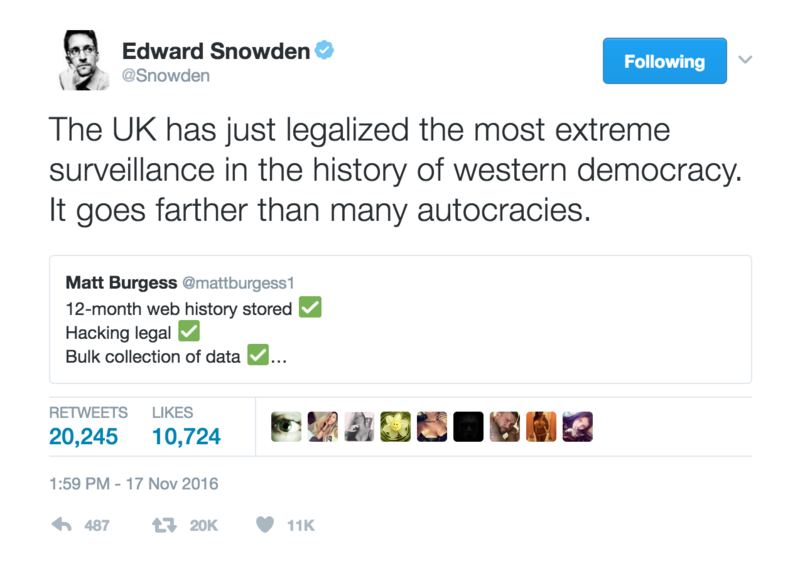 The UK has just legalised the most extreme surveillance in the history of western democracy. It goes farther than many autocracies. Although there are fierce oppositions, as the Queen signed the bill, the act become law eventually.